Long live comrade Lenin’s 147th anniversary! 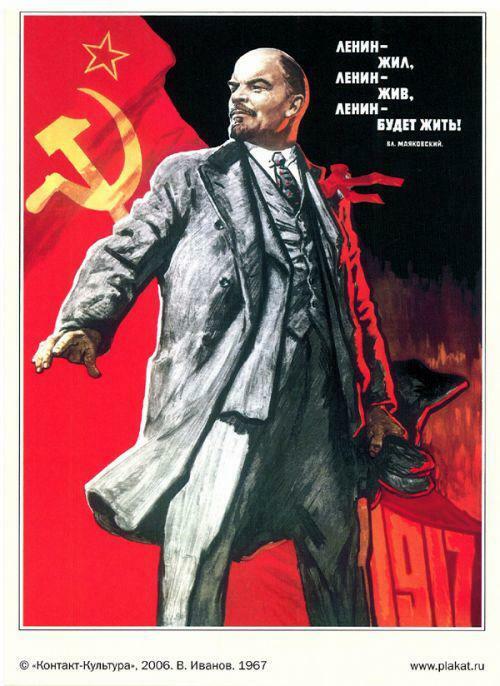 Today we celebrate the 147th birthday of Lenin. We greet the Leninists all over the world. The deep change since the victory of the October Revolution - which was led by Lenin - proves the invincible, revolutionary force of the ideas of Leninism. All the great victories of the period under the leadership of Stalin, under the leadership of the Comintern, and also of the period of socialist Albania under the leadership of Enver Hoxha took place under the great banner of Leninism. Lenin and his work are immortal. They will live on everywhere and forever. On the 147th birthday of Lenin we put in the center the "April Theses" of 1917 and we publish them in 22 languages of the world. The war being fought is an imperialist war and a peaceful, democratic ending to the war will only be possible if capital is overthrown. With "particular thoroughness, persistence and patience" this has to be explained to the masses. The unfolding revolution is passing from the first stage where power was put into the hands of the bourgeoisie to the second stage where power must be placed into the hands of the proletariat and the poorest section of the peasants. No support for the provisional Government, "a government of capitalists". Recognition that the Bolsheviks were a small minority in the Soviet and therefore it was necessary for a "patient, systematic and persistent explanation" of the errors of the other parties. At the same time to preach of the need to transfer "the entire state power to the Soviets of Workers Deputies." Not a parliamentary republic but a republic of Soviets of Workers', Agricultural Labourers' and Peasants' Deputies. No standing army but an armed people. Elected officials subject to recall and paid the same as a competent worker. Confiscation of all landed estates and nationalisation of all lands in the country. Banks to be amalgamated into a single bank under the control of the Soviet of Workers' Deputies. Social production and distribution of products under the control of the Soviets. Convocation of a Party Congress. Change Party programme on the imperialist war, the state and the minimum programme. Change of name to Communist Party. 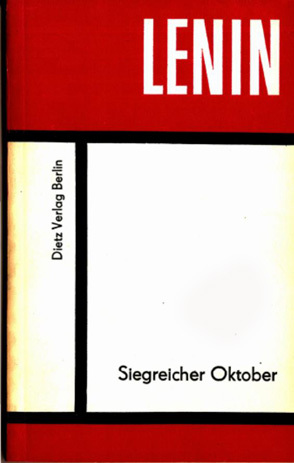 The historical significance of Lenin's theses is that they equipped the party with a theoretically grounded, concrete plan for approaching the transition from the bourgeois to the socialist revolution. 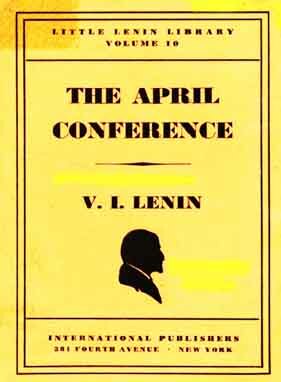 When Lenin presented his April ideas, the bourgeoisie declared him mad. But Lenin proved to be the leader of the victorious overthrow of the bourgeoisie. And today ? Today, the Comintern (SH) is declared crazy because we fight for the implementation of the Apriltheses on a global scale under the conditions of globalization. adopted by the Comintern (SH) on occasion of the 100th anniversary of Lenin's Apriltheses. Today, the wars being fought are wars of world imperialism and a peaceful, democratic ending to the wars of world imperialism will only be possible if world capital is overthrown. With "particular thoroughness, persistence and patience" this has to be explained to the masses all over the world. The socialist world revolution of today is passing from the current stage of the world power of the bourgeoisie to the second stage where power must be placed into the hands of the world proletariat and the poorest section of the peasants on a world scale. No support for the bourgeois governments of all countries, " governments in the service of world imperialism". Recognition that the Comintern (SH) is a small minority in the world and therefore it is necessary for a "patient, systematic and persistent explanation" of the errors of the other parties. At the same time we propagate the need to transfer "the entire state power to the Soviets Deputies of the Workers, Peasants and Soldiers on a global scale." Not a parliamentary world republic but a world republic of Soviets of Workers', Agricultural Labourers' and Peasants' Deputies. No armies of the world bourgeoisie but a red army of the world proletariat and the peoples. Elected officials subject to recall and paid the same as a competent worker - on a world scale. Global confiscation of all landed estates and centralized internationalisation of all lands all over the world. Banks of all countries to be amalgamated into a single world bank under the control of the global Soviet of Workers' Deputies. Social production and distribution of products under the global control of the Soviets. Convocation of a Congress of the Comintern (SH). Party programme for the overthrow of dictatorship of world imperialism and establishing the dictatorship of the world proletariat. The Comintern (SH) and her Sections guide the establishment of the world socialist system and its implementation in every country of the world. In the present situation of the world crisis of capitalism and the deep contradictions within the camp of world imperialism, the revolutionary communist world movement will develop increasingly. The victory of the proletarian world revolution which began under the banner of Marxism-Leninism will be crowned under the banner of Stalinism-Hoxhaism. Let us defend the Leninist banner against all revisionists, neo-revisionists and other anti-communists who try to slander comrade Lenin and to destroy his immortal teachings on imperialism. But just as the modern revisionists failed to accomplish this in the past, the neo-revisionists will also fail to accomplish this in the future. Today, the Comintern (SH) is the only true defender not only of comrade Lenin, but also of all other Classics, because it is impossible to defend one of the Classics without equally defending also all others without exception. To reject one of them means to reject all of them, it means to reject the lessons of all them as a whole. Based on the invincible teachings of the 5 Classics of Marxism-Leninism, we march resolutely towards the socialist world revolution, towards the world proletarian dictatorship, towards world socialism and world communism. Long live comrade Lenin, the 3rd Classic of Marxism-Leninism! Long live Leninism – an infallible signpost for the world socialist revolution! Down with all anti-Leninists, revisionists and neo-revisionists! Let’s rebuild the Comintern, let’s continue comrade Lenin’s work! Long live the 1917 Great October Revolution! Long live world armed, proletarian, socialist revolution! Long live the Comintern (SH) – the only authentic defender and follower of the 5 Classics of Marxism-Leninism: Marx, Engels, Lenin, Stalin and Enver Hoxha! Lenin arrived in Petrograd on the night of April 3. Thousands of workers, soldiers and sailors assembled at the Finland Railway Station and in the station square to welcome him. Their enthusiasm as Lenin alighted from the train was indescribable. They lifted their leader shoulder high and carried him to the main waiting room of the station. There the Mensheviks Chkheidze and Skobelev launched into speeches of "welcome" on behalf of the Petrograd Soviet, in which they "expressed the hope" that they and Lenin would find a "common language." 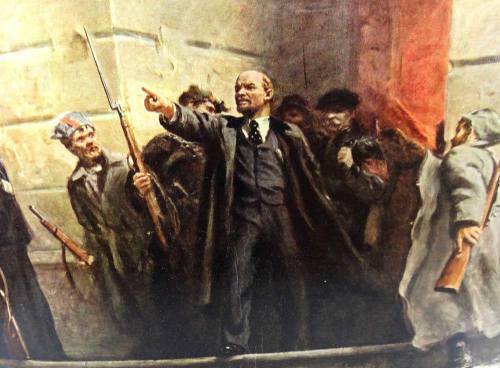 But Lenin did not stop to listen; sweeping past them, he went out to the masses of workers and soldiers. Mounting an armoured car, he delivered his famous speech in which he called upon the masses to fight for the victory of the Socialist revolution. "Long live the Socialist revolution!" were the words with which Lenin concluded this first speech after long years of exile. Back in Russia, Lenin flung himself vigorously into revolutionary work. On the morrow of his arrival he delivered a report on the subject of the war and the revolution at a meeting of Bolsheviks, and then repeated the theses of this report at a meeting attended by Mensheviks as well as Bolsheviks. 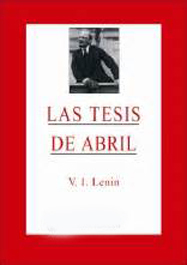 These were Lenin's famous April Theses, which provided the Party and the proletariat with a clear revolutionary line for the transition from the bourgeois to the Socialist revolution. 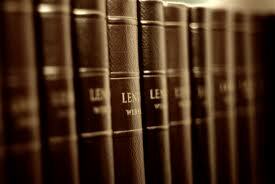 Lenin's theses were of immense significance to the revolution and to the subsequent work of the Party. The revolution was a momentous turn in the life of the country. In the new conditions of the struggle that followed the overthrow of tsardom, the Party needed a new orientation to advance boldly and confidently along the new road. Lenin's theses gave the Party this orientation. 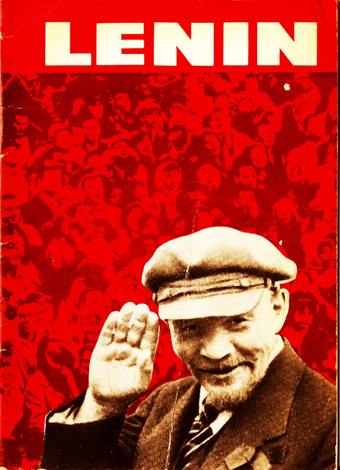 Lenin's April Theses laid down for the Party a brilliant plan of struggle for the transition from the bourgeois-democratic to the Socialist revolution, from the first stage of the revolution to the second stage -- the stage of the Socialist revolution. The whole history of the Party had prepared it for this great task. As far back as 1905, Lenin had said in his pamphlet, Two Tactics of Social-Democracy in the Democratic Revolution, that after the overthrow of tsardom the proletariat would proceed to bring about the Socialist revolution. The new thing in the theses was that they gave a concrete, theoretically grounded plan for the initial stage of the transition to the Socialist revolution. The transitional steps in the economic field were: nationalization of all the land and confiscation of the landed estates, amalgamation of all the banks into one national bank to be under the control of the Soviet of Workers' Deputies, and establishment of control over the social production and distribution of products. In the political field, Lenin proposed the transition from a parliamentary republic to a republic of Soviets. This was an important step forward in the theory and practice of Marxism. Hitherto, Marxist theoreticians had regarded the parliamentary republic as the best political form of transition to Socialism. Now Lenin proposed to replace the parliamentary republic by a Soviet republic as the most suitable form of political organization of society in the period of transition from capitalism to Socialism. Under the new government, the Provisional Government, the war continued to be a predatory imperialist war, Lenin said. It was the task of the Party to explain this to the masses and to show them that unless the bourgeoisie were overthrown, it would be impossible to end the war by a truly democratic peace and not a rapacious peace. As regards the Provisional Government, the slogan Lenin put forward was: "No support for the Provisional Government!" 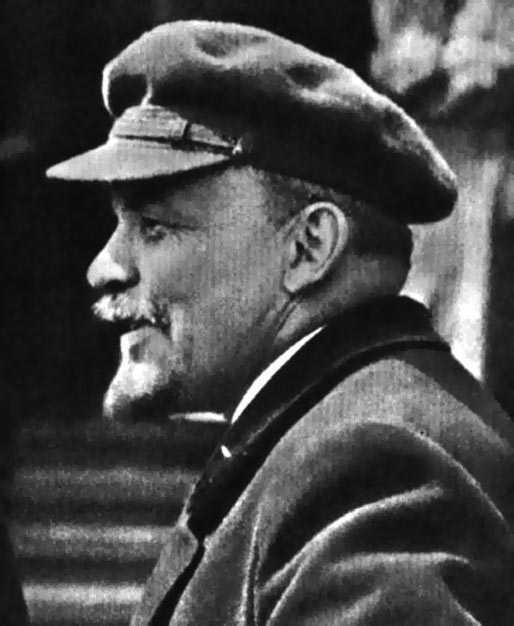 This meant that Lenin was not calling for a revolt against the Provisional Government, which at that moment enjoyed the confidence of the Soviets, that he was not demanding its overthrow, but that he wanted, by means of explanatory and recruiting work, to win a majority in the Soviets, to change the policy of the Soviets, and through the Soviets to alter the composition and policy of the government. This was a line envisaging a peaceful development of the revolution. Lenin further demanded that the "soiled shirt" be discarded, that is, that the Party no longer call itself a Social-Democratic Party. The parties of the Second International and the Russian Mensheviks called themselves Social-Democrats. This name had been tarnished and disgraced by the opportunists, the betrayers of Socialism. Lenin proposed that the Party of the Bolsheviks should be called the Communist Party, which was the name given by Marx and Engels to their party. This name was scientifically correct, for it was the ultimate aim of the Bolshevik Party to achieve Communism. Mankind can pass directly from capitalism only to Socialism, that is, to the common ownership of the means of production and the distribution of products according to the work performed by each. Lenin said that our Party looked farther ahead. Socialism was inevitably bound to pass gradually into Communism, on the banner of which is inscribed the maxim: "From each according to his abilities, to each according to his needs." Lastly, Lenin in his theses demanded the creation of a new International, the Third, Communist International, which would be free of opportunism and social-chauvinism. 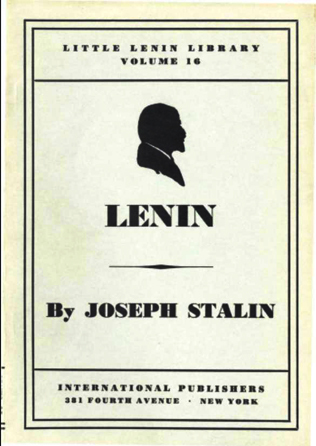 Lenin's theses called forth a frenzied outcry from the bourgeoisie, the Mensheviks and the Socialist-Revolutionaries. The Mensheviks issued a proclamation to the workers which began with the warning: "the revolution is in danger." The danger, in the opinion of the Mensheviks, lay in the fact that the Bolsheviks had advanced the demand for the transfer of power to the Soviets of Workers' and Soldiers' Deputies. 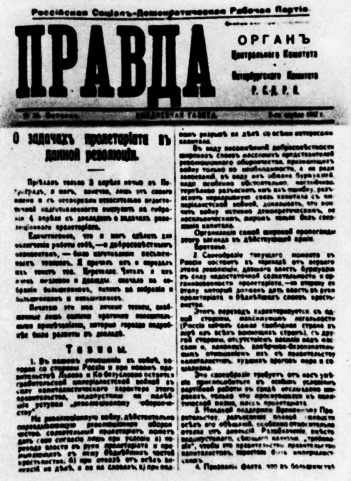 Plekhanov in his newspaper, Yedinstvo (Unity ), wrote an article in which he termed Lenin's speech a "raving speech." He quoted the words of the Menshevik Chkheidze, who said: "Lenin alone will remain outside the revolution, and we shall go our own way." On April 14 a Petrograd City Conference of Bolsheviks was held. The conference approved Lenin's theses and made them the basis of its work. Within a short while the local organizations of the Party approved Lenin's theses. 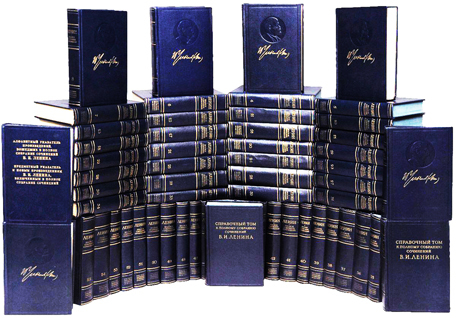 The whole Party, with the exception of a few individuals of the type of Kamenev, Rykov and Pyatakov, received Lenin's theses with profound satisfaction. 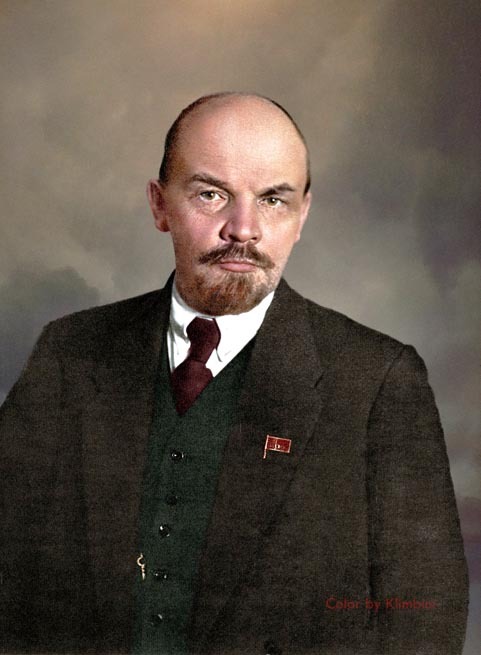 Vladimir Ilyich Lenin 22.4.1870.- 21.1.1924. Vladimir Lenin Lenin (Simbirsk, 22 April 1870 - Gorki near Moscow, 21 January 1924), revolutionary, politician and political theorist, one of the classics of Marxism-Leninism. Born into a middle class family in Simbirsk, Lenin has gained interest in the revolutionary left-wing politics. After the murder of his brother Alexander in 1887, was expelled from the State University of Kazan for participation in the anti-imperial protest. 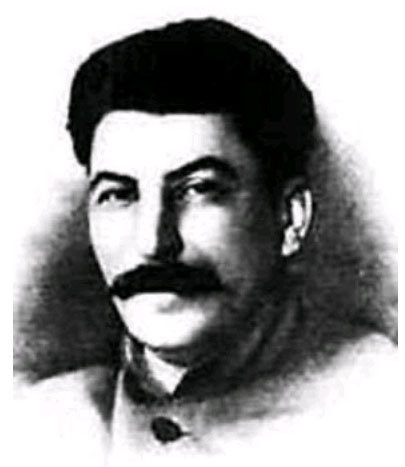 In 1893 he moved to St. Petersburg and became a prominent member of the Russian Social Democratic Labor Party (RSDLP). Lenin was caught because of the rebellion and banished to Krasnojark for three years. After exile, he went to Western Europe, where it became known as a prominent theoretician of the party, thanks to its publications. In 1903 he led the Bolshevik power against the Mensheviks Martov. Briefly returning to Russia during the revolution in 1905 .After the February Revolution in 1917, the overthrow of the Tsar and the establishment of a provisional government, Lenin returned to Russia. 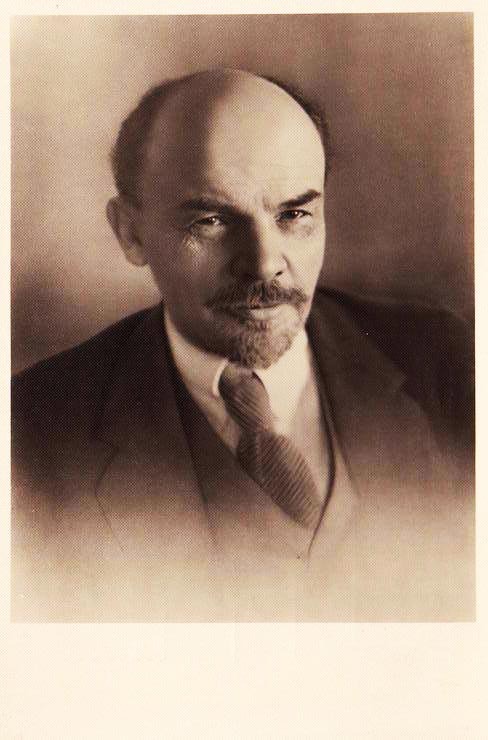 Lenin was the leader of the October Revolution in 1917. Created by the Council of People's Commissars with Lenin as chairman. Lenin was elected as prime minister of the Russian Congress of the Soviets. 1924. Lenin died at his home in Gorky. Glory to the great Lenin, the classic theory of Marxism-Leninism! Great Lenin and his work live forever! Glory to Marxism-Leninism! Long live the Comintern (SH)! نشر أول مرة: "البرافدا" العدد 26 في 7 نيسان 1917. Poněvadž jsem teprve 3. dubna v noci přijel do Petrohradu, mohl jsem na schůzi 4. dubna přednést referát o úkolech revolučního proletariátu pochopitelně pouze za svou osobu a s výhradou, že jsem poměrně nedostatečně připraven. Jediné, co jsem mohl učinit, abych usnadnil práci sobě — a také poctivým oponentům — bylo, že jsem vypracoval písemné these. Přečetl jsem je a dal je soudruhu Ceretělimu. Četl jsem je velmi zvolna a dvakrát: nejprve na schůzi bolševiků a potom na schůzi bolševiků i menševiků. Otiskuji tyto své — za svou osobu přednesené these — opatřené jen zcela stručnými vysvětlivkami, které byly mnohem podrobněji rozvedeny v referátu. 1. V našem poměru k válce, která se strany Ruska i za nové vlády Lvova a spol. bezpodmínečně zůstává vlivem kapitalistického rázu této vlády lupičskou imperialistickou válkou, jsou nepřípustné sebemenší ústupky „revolučnímu obranářství“. Na revoluční válku, která by vskutku ospravedlňovala revoluční obranářství, může třídně uvědomělý proletariát přistoupit jedině pod těmito podmínkami: a) že moc přejde do rukou proletariátu a k němu se přimykajících chudých vrstev rolnictva, b) že bude upuštěno od všech anexí doopravdy, a nikoli slovy, c) že bude úplně a doopravdy zúčtováno se všemi zájmy kapitálu. Jelikož široké vrstvy prostých stoupenců revolučního obranářství to nesporně myslí dobře a schvalují válku jen proto, že ji pokládají za nezbytnou, a ne proto, že by toužily po výbojích, a jelikož jsou klamány buržoasii, je třeba jim zvlášť důkladně, vytrvale a trpělivě objasňovat jejich chybu, vysvětlovat nerozlučnou spojitost mezi kapitálem a imperialistickou válkou, dokazovat, že není možno skončit válku mírem opravdu demokratickým a nenásilným bez svržení kapitálu. Budiž organisována nejširší propaganda tohoto názoru v armádě na frontě. 2. Svéráznost nynější situace v Rusku záleží v přechodu od první etapy revoluce, etapy, která dala moc buržoasii, protože proletariát nebyl dostatečně třídně uvědomělý a zorganisovaný, k druhé její etapě, k etapě, která musí dát moc do rukou proletariátu a chudých vrstev rolnictva. Tento přechod se vyznačuje jednak nejširší legalitou (Rusko je nyní ze všech válčících zemí nejsvobodnější země na světě), jednak tím, že nepoužívá násilí vůči masám, a posléze jejich slepou důvěřivostí k vládě kapitalistů, úhlavních nepřátelů míru a socialismu. Tato svéráznost vyžaduje od nás umění přizpůsobit se zvláštním podmínkám stranické činnosti mezi nebývale širokými masami proletariátu, které právě procitly k politickému životu. 3. Žádnou podporu Prozatímní vládě; budiž objasňována naprostá prolhanost všech jejích slibů, zejména slibů, že se vzdá anexí. Pranýřování místo nepřípustného, iluse budícího „požadavku“, aby tato vláda, vláda kapitalistů, přestala být imperialistickou. 4. Budiž konstatováno, že ve většině Sovětů dělnických zástupců je naše strana v menšině, a to prozatím v slabé menšině, proti bloku všech maloburžoasních oportunistických živlů — počínaje lidovými socialisty, sociálními revolucionáři až po organisační výbor (Čcheidze, Ceretěli a j. ), Stěklova a j. a pod., — které podlehly vlivu buržoasie a jsou nositeli jejího vlivu na proletariát. Vysvětlovat masám, že Sověty dělnických zástupců jsou jedině možnou formou revoluční vlády, a že proto naším úkolem, pokud tato vláda podléhá vlivu buržoasie, může být jedině trpělivé, systematické a vytrvalé vysvětlování chyb jejich taktiky, při kterém bude přihlíženo zejména k praktickým potřebám mas. Pokud jsme v menšině, kritisujeme a poukazujeme na chyby, a přitom zároveň zdůrazňujeme, že je nutno dát veškerou státní moc Sovětům dělnických zástupců, aby se masy na podkladě vlastních zkušeností zhostily svých chyb. 5. Nikoli parlamentní republika — návrat k ní od Sovětů dělnických zástupců by byl krokem zpět — nýbrž republika Sovětů dělníků, zemědělských dělníků a rolníků v celé zemi, od zdola až nahoru. Odstranění policie, armády a byrokracie. Platy všech úředníků, kteří všichni budou volitelní a kdykoliv sesaditelní, ne vyšší než průměrná mzda kvalifikovaného dělníka. 6. V agrárním programu budiž těžiště přeneseno na Sověty zástupců zemědělského dělnictva. Znárodnění veškeré půdy v zemi. O půdě nechť rozhodují místní Sověty zástupců zemědělských dělníků a rolníků. Budtež utvořeny zvláštní Sověty zástupců chudých rolníků. Z každého velkostatku (výměrou přibližně od 100 do 300 děsjatin podle místních a jiných podmínek a podle rozhodnutí místních orgánů) se utvoří vzorné hospodářství pod kontrolou zástupců zemědělského dělnictva a vedené na veřejný účet. 7. Okamžité sloučení všech bank v zemi v jednu celonárodní banku, která budiž podřízena kontrole Sovětu dělnických zástupců. 8. Nikoli „zavedení“ socialismu jako náš bezprostřední úkol, nýbrž okamžitý přechod pouze ke kontrole nad společenskou výrobou a distribucí výrobků, kterou by vykonávaly Sověty dělnických zástupců. Podnět k založení revoluční Internacionály, Internacionály proti sociálšovinistům a proti „centru‘‘ . Aby čtenář pochopil, proč jsem zvláště podtrhl jako vzácnou výjimku „případ“ poctivých oponentů, prosím jej, aby s těmito thesemi porovnal tuto námitku pana Goldenberga: Lenin „vztyčil prapor občanské války uprostřed revoluční demokracie“ (citováno z listu pana Plechanova „Jedinstvo“ č. 5). Co je to? Čím se to liší od štvaní k pogromům? Od psaní listu „Russkaja Volja“? A oponenti jistého druhu vykládají mé názory tak, jako bych vyzýval k „občanské válce uprostřed revoluční demokracie“!! Útočil jsem na Prozatímní vládu proto, že nestanovila ani brzkou, ani vůbec jakoukoliv lhůtu k svolání Ústavodárného shromáždění a snaží se vyvléci sliby. Dokazoval jsem, že bez Sovětů dělnických a vojenských zástupců není svolání Ústavodárného shromáždění zajištěno a že jeho zdar je nemožný. Vkládají mi do úst názor, jako bych byl proti nejrychlejšímu svolání Ústavodárného shromáždění!!! Nazval bych to „třeštěním“ ‚ kdyby mne desetileté politické boje nenaučily hledět na poctivost oponentů jako na vzácnou výjimku. G. Plechanov nazval ve svých novinách mou řeč „třeštěním“. Výborně, pane Plechanove! Pohleďte však, jak jste ve své polemice neohrabaný, nemotorný a nedovtipný. Jestliže jsem dvě hodiny mluvil jako z horečky, jak to, že stovky posluchačů strpěly toto „třeštění“? Dále. Proč váš list věnuje celý sloupec výkladu „třeštění“? Špatně, prašpatně se u vás srovnává jedno s druhým. Je ovšem mnohem snazší křičet, spílat a lkát, než se pokusit vylíčit, vysvětlit a připomenout, co soudil Marx a Engels roku 1871, 1872 a 1875 o zkušenostech Pařížské komuny a o tom, jaký stát potřebuje proletariát. Bývalý marxista pan Plechanov si pravděpodobně nechce vzpomenout na marxismus. Citoval jsem slova Rosy Luxemburgové, která 4. srpna 1914 nazvala německou sociální demokracii „páchnoucí mrtvolou“. A páni Plechanovové, Goldenbergové a spol. „jsou uraženi“… kvůli komu? — kvůli německým šovinistům, nazvaným šovinisty! Ubozí ruští sociálšovinisté, socialisté slovy, šovinisté skutky, byli opravdu přivedeni z konceptu. T. j. takového státu, jehož předobrazem byla Pařížská komuna. vydání, sv. I, 1937, str. 103 – 107. Ce que sont les «amis du peuple» ?